Before we left Mafra we arranged for the dogs to have a bath and a haircut. Living in such close proximity creates a certain sense of urgency when they start to smell a bit doggy, so we grabbed the opportunity when we discovered that the vet’s practice also had a grooming room. We dropped them off and wandered around town feeling like parents with an unexpected couple of hours of freedom. Finally, we cleaned the van from end to end and got ready for moving on. The mutts were returned to us looking as though they belonged to someone else. Poppy had a bow in her hair and Boo was wearing a tie and looking faintly embarrassed. As soon as she was out of range of the groomer Poppy lifted up a paw and deftly sent her bow into a ditch. She really isn’t a pink ribbon kind of a girl. We rescued it and put it back on for the photo shoot, much to her disgust. A trip to Intermarché to do the laundry and fill up with diesel and we realised it was getting too late to set off for the coast, so we returned to our pitch on the motorhome parking, that had by then started to feel like home, and slept like dead things until morning when we finally bid Mafra farewell. The Sintra coastline is famous for crashing waves, surfing, wild scenery and white beaches so we stopped at the first one, to have breakfast and a walk on the beach. In the huge carpark, we saw a number of motorhomes and surfers’ VWs so we knew it was okay to park there. After last year’s experiences of being moved on by the police, we’re a little bit wary of parking where we’re not supposed to. The other motorhomers were allowing their dogs to run freely around the carpark so we did the same, only to see Poppy, of the pretty as a picture in a pink bow fame, taking on a massive Great Dane reminiscent of Scooby Doo. He stood looking down at her from his great height and I swear we could hear him laughing, then Poppy took off towards the beach. He stood watching as she belted across the sand then shrugged and took about six loping steps and skidded to a halt in front of her. This was obviously a game and they played together for a few minutes before the Great Dane’s owner called him back and we headed on to the beach. Boo is not a fan of playing with other dogs so he walked beside us with his newly shorn nose in the air. From inside the van, you could have been fooled into thinking that the bright sunshine and blue sky meant that it was warm out there but as soon as we were on the beach and facing the ocean we were shivering. Watching dozens of surfers in the water made us feel even colder so we gave up and returned to the warmth of the van and mugs of hot coffee. These surfing types are hardy beasts. We planned to stay the night further up the coast at a motorhome official parking place but when we got there we discovered that the parking was narrow and right up against some bushes. To get out of the door we would have had to negotiate a hedge. This was not our idea of fun so we moved on to Sintra itself and the First of December Football Club where there is motorhome parking. We drove in through a narrow gate, up a narrow road and into a tight space where motorhomes were on one side and cars on the other. There we were met by a friendly German man who spoke to us in that wonderful version of English that contains some German words, some English, some French and a lot of sign language. We’re relaxing a bit about our inability to speak other languages now – you just do your best with a few words that may or may not make sense to the other, wave your arms and smile a lot. Our German friend said, “La Patron, he come, his door open. Gut! Gut!” … or words to that effect. The caretaker of the place appeared and shifted some barriers, strategically placed to stop the cars pinching the motorhome spaces and invited us to reverse in. Doing this involved nosing the motorhome between a BMW and a tree, driving up close to a sheer drop down to the football pitch and then reversing between two other motorhomes. Shirley and I have an efficient method in situations like this where one drives and the other directs the procedure using gestures whilst standing at the back of the motorhome, so we got in the space without any problem at all. At this, the German man began applauding and shouting “Wunderbar! Two ladies! Top Team! Wunderbar!” Clearly, meeting two women who can drive a big motorhome had made his day. It was Sunday afternoon and to Shirley’s absolute delight it transpired that a football match was about to start. See the next post for Shirley’s guest blog about finding her happy place. The next morning we made a decision that might come as a surprise – we left Sintra without going into the centre to see it. We know it’s a lovely place and we really did want to go in and see the sights but we found ourselves on the horns of a dilemma. We couldn’t find anywhere to give the dogs a decent walk and we would never go out for several hours, leaving them in the van, without making sure they were comfortable and ready to sleep a good part of the day away. The parking at Sintra has only busy roads all around. It is on a massive intersection and, despite my best efforts, I ended up walking them beside a very busy road with the roar of traffic making them jump and with absolutely no chance of letting them off lead for a run. So, in the end, we settled for the happy Sunday afternoon we had spent at the football ground – more on that later – and we drove on to the next stop. To be honest we’re not big fans of taking the motorhome to big towns and cities and we had already decided to make Lisbon a destination for a city break by air at a later date. Now we can add Sintra to that plan as it is on the rail route from Lisbon. We love our little canine companions but there are times when they limit what we can do. We wouldn’t be without them – most of the time. Our next plan was to visit the Palace of the Bacalhao Winery, once again recommended by Katherine and James, our intrepid motorhoming friends. Sometimes even a combination of satnav and maps are not enough to get you to where you intended to go and this time our satnav let us down big style. Turning left as requested, at a random point that seemed to look quite sensible from the roadway, we found ourselves not in a winery but on a narrow cobbled road full of small artisan workshops. Quickly realising our error we hit on the idea of turning the motorhome around and going back from whence we had come. Please take note of the proud way I earlier described our ability to manoeuvre this great beast because here we proved the saying that pride does indeed come before a fall. Having turned the van into an entryway and completely bunging up the whole road, we found ourselves stuck – I mean really stuck. There we a shallow rain trench on the side of the road and our back wheels were in it. This effectively lowered our back axle and jammed our tow bar and rear steadies into the tarmac. We were going nowhere. Every movement in either direction brought on the most horrific grinding noises and Shirley could see great gouges in the tarmac getting worse at every move. In the meantime, traffic was building up both above and below us and we had no idea what to do. Finally, a very kind man came out of one of the workshops and politely asked if he could help. I doubted that he could but at least we weren’t alone facing two frustrated lorry drivers, three white van men and a number of car drivers, all turning a little pink and looking as though steam might start coming out of their ears. Then our friend performed a miracle – he calmly suggested that I turned the wheel sharp right and drive into a bush. This unlikely suggestion, being the only option available to us, turned out to be the answer. Doing this lifted one of the wheels out of the trench, thus lifting our undercarriage off the tarmac and we could reverse. We then negotiated all the waiting traffic with as much dignity as we could muster, calling out our thank yous to our rescuer and left. The driver’s nerves were in tatters, the snooty satnav adamantly refused to admit her mistake and tried to take us back to the same place and we were thoroughly disheartened so we set our sights on the next overnight stop, two glasses of red wine and a bowl of peanuts. Culture will have to wait for another day – comfort was all we could think of. Ha! Have you noticed that days like this don’t end quietly? The chosen overnight stop was Ecopark Setubal. Advertised as a motorhome parking place with full facilities and views over the water. We saw that it was a little more expensive than our normal nightly stops but we thought it would be a real treat. What they don’t tell you is that it’s on a windy narrow road from Setubal. Even before we got to Setubal our seriously insane satnav kept trying to persuade us to take farm tracks to avoid going along proper roads. We ignored her instructions to turn right at the next tiny, dusty turning and adamantly stayed on the road. Every time the satnav said “Just ahead turn right” and we saw the size of the path she thought we could go down, we gave her dog’s abuse. It didn’t stop her trying. These things, clever and useful as they are, can be seriously annoying when they’re having a bad day. Ecopark Setubal is miles from anywhere. Yes, you have beautiful views of the water but you will need to settle for the quiet life and make sure you’ve brought everything you need. Even the quiet life was a bit of an exaggeration as there was the low rumble of some kind of machinery from somewhere out in the bay, running twenty-four hours a day. The lady at reception was exceptionally friendly and she suggested that we didn’t close the blinds until the moon came up. Oh, how right she was – we forgot all about our frustrating day when we looked up to see the rising super moon casting its glow over the water and lighting up the sky. That was when we remembered why we chose to travel in a motorhome. Where else could we find such a variety of experiences and be able to live within our means at the same time? Leaving Setubal the next morning we encountered another round of satnav insanity and hit on the idea of looking at road signs. These are not always available but in Setubal they were plentiful so we followed the sign that said Algarve and headed south. 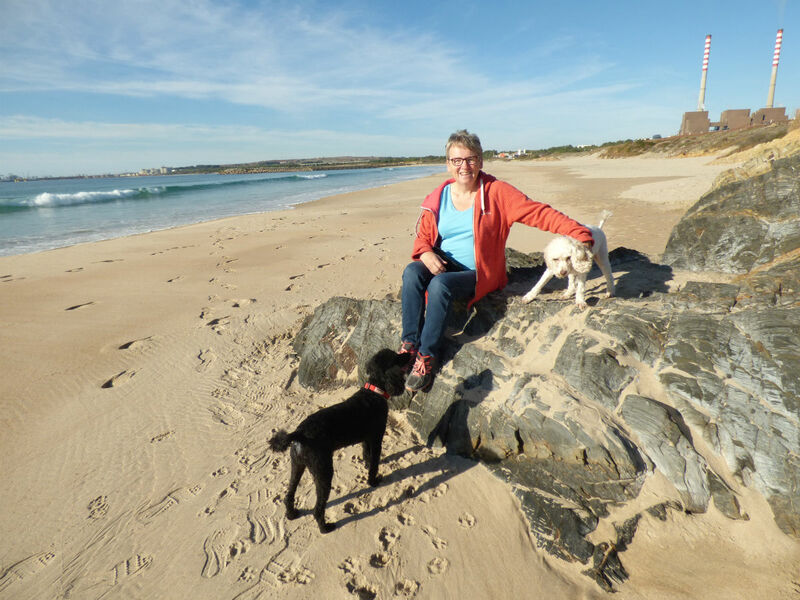 We stopped for lunch at a big motorhome park near Sines, walked on the beach, felt the rising temperatures that we had hoped for as we headed southwards and then moved on to Porto Covo. Here the local community has solved the problem of massive numbers of motorhomes looking for a place to stop by providing a motorhome parking in the town created from an old football pitch. We wandered in to see what the place was like and saw the motorhome that belonged to Melanie and Ian, friends we had made in the bar at Peso de Regua. We had a great evening together, drinking beer and putting the world to rights, talking about our travels and enjoying their company. It struck us, after our lovely evening, that when we travel in the motorhome we are much more able to have impromptu social events that are relaxed and easy than we ever do at home. You meet up, often coincidentally, and share simple food and drinks with people you would never have met when at home. And so it was that we finished our meander down through Portugal and made our way to the Algarve, the sunny south where we plan to enjoy the depths of winter before heading north again when spring begins to emerge. We are currently tucked in cosily at the motorhome park at Lagos in the sunshine, enjoying the long walks around town and to the beach. Last night we met up with our friends Jo and Doug, also members of the Peso de Regua ‘meet you in the bar’ set, for a meal at a local restaurant. We laughed, chatted, drank wine, ate good food and agreed that indeed, life is good. Poppy is also showing her Poo side rather than the cocker … she is such a ladette and would drink pints with the boys. Sorry you didn’t make the Bachalo winery and palace tour …. there’s always another time. When do you move on site? Well, to add to the saga of the satnav, ours seems to like to take us all the B roads it can find. Sometimes, when you can SEE your destination, it tells you to go around it to get there! At least we’re not in a huge motorhome but in our manageable, little Honda Jazz. Patricia usually maps out our route in an effort to avoid these dilemmas. However, what happens is, she THINKS she remembers the route and then when we’re lost she tells me to kick in the satnav! It’s like you can’t win! Then, if I should hesitate in telling her to make a turn, look out, because I hear she needs to have plenty of warning to ensure she’s in the correct lane! It’s not ME hesitating, it’s the voice on the satnav. I’m surprised to can’t HEAR some of these insane conversations! In the end, we get there, but it’s not pretty. I feel your pain! I think the little blighters are set to go the shortest route rather than the easiest one. I’m going to look to see if ours has another setting. Getting in the right lane can be a bit of a nightmare, especially in a big van. We find that most of the local people are quite patient with us – thank goodness.